Seize life! Eat bread with gusto. Oh yes-God takes pleasure in your pleasure! Don't skimp on colors and scarves. Whatever turns up grab it and do it. And heartily! In the company of the dead, where you're most certainly headed. 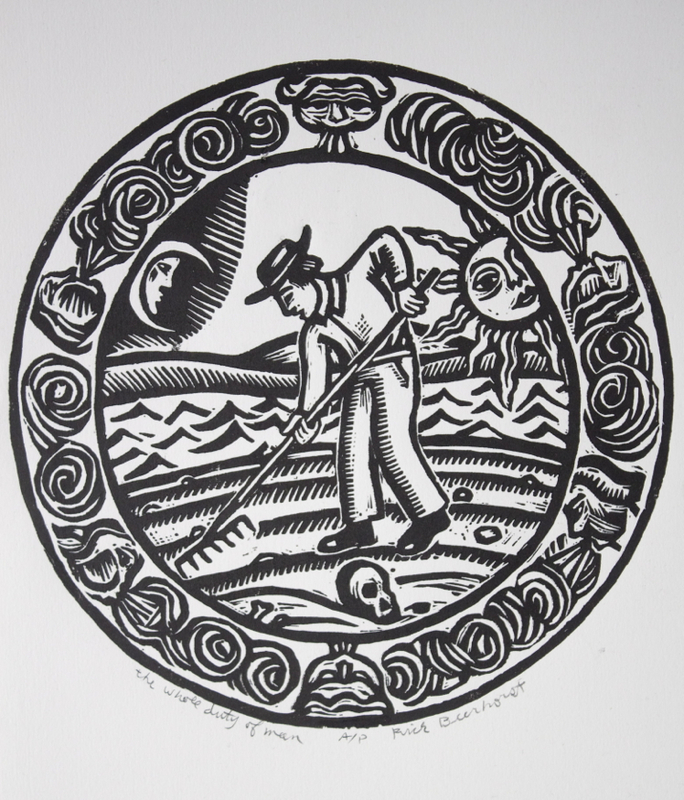 This is a new woodblock I have just finished carving and have begun to print. I am in a printmaking kind of summer this year. I love the simplicity that carving an image into wood forces me into. I like the sound of removing the wood with the chisels. I use an oil stone and a leather belt nearby to keep a sharp edge on all the tools. I am thinking that this block may end up being the poster that goes along with the new Wealthy Wealthy Orphans album Throwing Glory. This is where we are in the design of the new Wealthy Orphans album titled Throwing Glory. These are woodblock images that are first developed with pencil sketches and then transferred to pieces of cherry wood which are then carved into the surface of the wood. 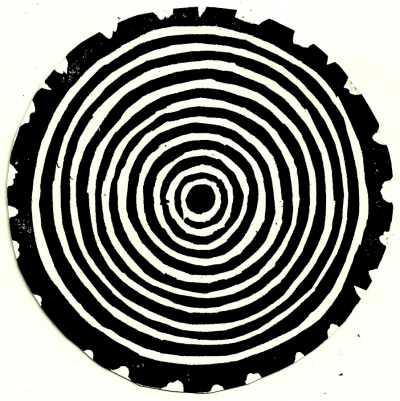 The next step is printing on to paper which is done by rolling ink on to the surface of the carved wood block, carefully laying a trimmed piece of paper down and then burnishing the paper that is laying on the inked block being careful not to allow the paper to shift in the process which would ruin the print. The paper is removed and then allowed to dry. This process of reproducing images is thousands of years old and done in the same way it has always been done. Taking the time to make an elaborate hand crafted CD package design in an era of free music down loads becomes a potent statement and labor of love. We want to send out something beautiful and valuable out into the world and this is what we are in the process of doing to our best ability. "If anyone unwarily draws in too close and nears the singing of the Sirens, his wife and children will never welcome him home again, for they sit in a green field and warble him to death with the sweetness of their song. There is a great heap of dead men's bones lying all around, with flesh still rotting off them. Therefore pass theses Sirens by....."
"Supernatural forces springs from the fusion of two biologically different entities, opposites that embrace and explain practically everything." The myth of the mermaid have always fascinated me. The notion of the Siren leading a man to death is the predominate interpretation and yet Carl Jung goes beyond this obvious first reading to the notion that in the sailor embracing the mermaid we have yet another metaphor of our irrepressible longing to connect our physical existence with the supernatural world. 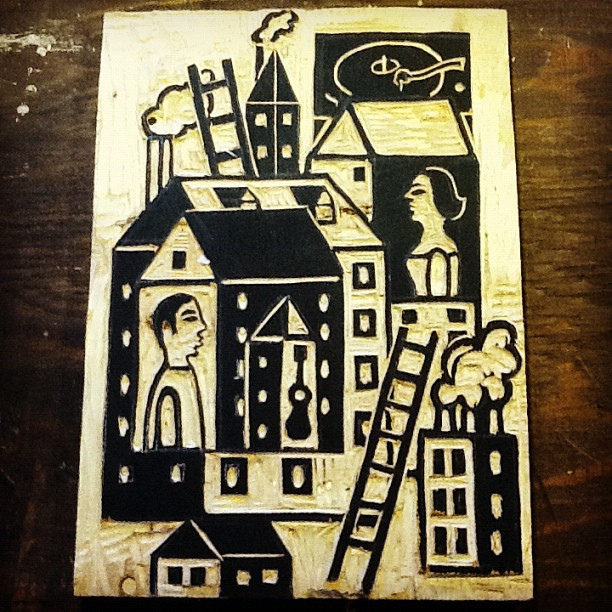 This is a new woodblock card I made yesterday. I am going to send it to some one on my list of snail mailfriends. I'm not sure who. I love getting a personal cards and letters in the mail. Sometimes I open an envelope thinking it is a personal letter and it turns out to be a form letter someone has sent out to a whole list of people. I hardly ever read more than a few lines of these. They are always a disappointment. I like the old fashioned one at a time hand written message from a friend. There is just nothing like it in my book. "Jesus is never upset at sinners; he is only upset with people who do not think they are sinners! Jesus is fully at home with the tragic sense of life. He lived and rose inside it. I am now personally convinced that Jesus' ability to find a higher order inside constant disorder is the very heart of his message and why true Gospel, as rare as it might be, still heals and renews all that it touches." This orginal print available here. Relish life with the spouse you love. This is your last and only chance at it. In the company of the dead, where you're most certainly headed."